But before the beginning … Thank you to all the people who answered our questions! Elite Survey Sites, which is one of the most popular paid surveys blog, finally decided to get real feedback from people who make money through paid surveys – survey panelists! So far, no one has done similar surveys! Our goal was, of course, to understand people’s problems, and based on that, to plan our blog content from now on, but we also plan to go further. We have announced that we plan to make some changes by reporting your answers to survey panels and asking them whether they can improve anything. After the results are released, starting today, we have a much better insight and we plan many new things, so stay tuned. We will let you know the details in our next posts, but stay assured that it will be interesting and different from what other sites are doing. We do our surveys in a slightly different way from other sites. For those of you who want to know how we do them, go to our studies page, and there you will find everything explained in detail. But in brief! Our surveys are still open and will always be open. Everyone is invited to complete them. We plan to release new data a few times a year if we find significant changes in the answers. Next surveys will be released in December 2017. Till then, vote! How Do We Find People to Answer Our Surveys? Based on this information, we can conclude that the data is absolutely reliable. First of all, most of the people see paid surveys as extra income only (although we are an advanced paid surveys blog, we recommend that people use them for extra income only, not your full time work, although there are people who do this full time). Less than 10% of the people would pay to register with a panel. This proves that people understand that there is no need to pay to register with survey panels. In addition, most people go over obvious scams like: “buy our system and you will start making $100/hour with paid surveys”. Let’s say it again: No need to pay for surveys! Only 14 people from about 1,000 said that all surveys are scams. Sorry, but this is an extremely low percentage to consider this answer relevant. 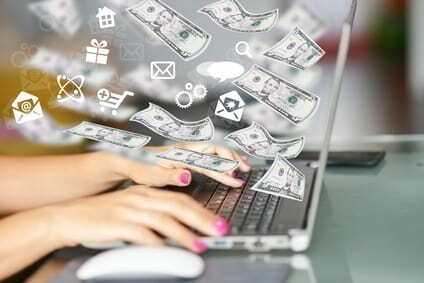 Instead, we read many great things that people are doing to check their legitimacy- many people use BBB and also read comments and blogs, many people said that sites requesting SSN and credit card information are scam and so on, but this is much different from saying that all surveys are scams! Although we expected more negative votes against paid surveys disqualification, which definitely is something negative, we found that people didn’t answer that way. It seems that people understand that this sometimes happens. Instead, we got great tips on what companies can do to optimize the disqualification process and we will write about this in our next posts. 70.7% of survey panelists reported that they make less than $100 a month with paid surveys. Sad news, you’d say! Ok … we are really sorry about this high percentage and we will definitely do our best to help with that in our next posts. You will see what we plan to do, but we also wanted to give some additional clarification on this percentage. We also wanted to mention that about 10% of the people reported over $1,000 income a month. This question is actually connected with some of the other questions. Here is what we can also say: 52.9% of the people answered that they spend less than 3 hours a week, 78.5% of the people reported that they spend less than 10 hours a week on this activity. These additional stats prove that most of the people don’t do paid surveys full time, so it is understandable that they don’t make a lot of money. This probably makes this sad news slightly better. Actually, no one can expect to make a lot of money working on something for 3 hours a week. This is what our next finding is based on. Most of the people consider paid surveys extra income. Ok, about 30% voted that surveys are their source of extra income. This looks like a high percentage, because in our personal opinion, it would have to be about 10%. 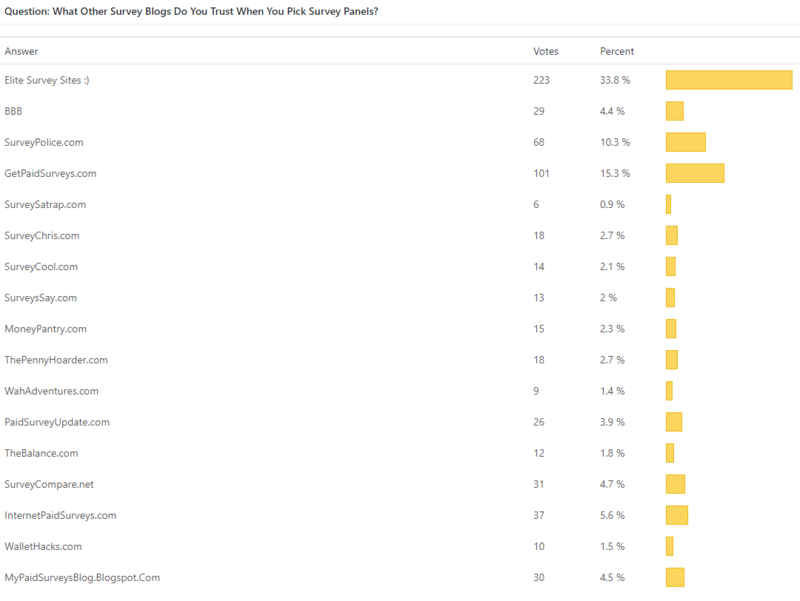 But … you have to know that most of the people who voted are people who are registered on our site, and these are people who are more closely interested in paid surveys. We are sure that, if we asked random people looking for paid surveys online, this percentage would be lower. Paid surveys are not scams! Based on several questions, we can finally say that. Only 14 people from about 1,000 said that paid surveys are scam. We have also found that a very low percentage of people said all surveys are legitimate – only 54 people from 1,000 said that. Instead, people prefer to verify the panel legitimacy before registering. People prefer to read about the panel in BBB, comments, blog posts, forums, etc. before registering. Many people said that sites with paid registration are scam, many people said that sites requesting SSN and credit card information are scam. Only true things! But … this is totally different from saying that paid surveys are a complete scam! Special thanks to those 144 people who voted that they trust the panels listed on our site 🙂 … we post only legit panels, you know that. Disqualification! The most common reason for disqualification is: “The quota has been reached” – 34.8%. About 30% of the people have been disqualified after they completed a short pre-qualification survey, which is something, let’s say, positive, because that way, people don’t waste time on the whole survey. 12.3% of the people didn’t complete their profile survey correctly, and about 7% of them have been disqualified because of incorrect answers. These problems are a result of people’s mistakes, not of survey companies’ systems, and we have explained them many times. If people want to make money, they have to answer the questions correctly and to complete and update their profile surveys correctly. People prefer relatively short surveys. Although there are many high-paying offers that pay more if you spend longer time on them, it is obvious that people prefer short surveys. Only 7% prefer surveys that are about 1 hour long. 45.9% of the people prefer short surveys (about 10 minutes long). 47.2% of the people prefer average surveys – about 30 minutes. The most common problems and requests from people are: 1. faster payment; 2. a bigger number of high-paying offers; 3. Paypal payment option. We highly encourage survey companies to read them carefully and work on them. Dear Paid Survey Companies, there is a room for improvement that people requested of you. We will write a few posts explaining in details people’s problems that we have found. But one thing is for sure: If people feel better on your panels, you will get more panelists, you will become more popular and you will make more money. All survey companies who want to make some changes, let us know. Feel free to copy the graphs below on your blogs, social media and so on, no copyright issues! Please Share The First Surveys About Paid Surveys August 2017! How Much Do You Make a Month With Paid Surveys? On Average, How Many Hours a Week Do You Spend on Completing Paid Surveys? Are Paid Surveys Your Main Source of Income? Yes – Paid surveys are my main source of income. No – Paid surveys are only extra income for me. How Many Paid Survey Companies are You Registered With? We encourage every survey panel to review the request from people and make changes if that possible. That way you will have more people, registered with your company. What Is Your Favorite Survey Length? I prefer relatively quick surveys (~10 min). I prefer surveys of average length (~30 min). I prefer relatively long surveys (~1 hour). What Types of Surveys Do You Prefer? What are Your Favorite Payment Options? Which of These Features Would You Like to Have in Your Survey Panels? Would You Pay to Register with a Survey Panel? How Do You Know if a Survey Panel is Legit? I believe that every survey panel on Google is legitimate. I trust only BBB-verified survey panels. I check if the panel is listed in survey directories. I believe that every survey panel that is free to register is legitimate. 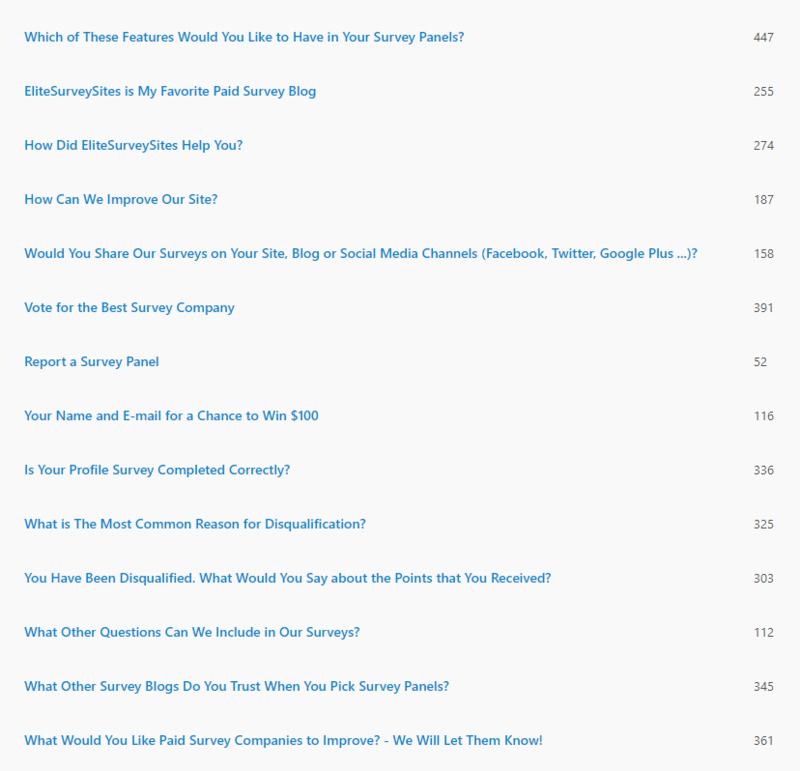 A survey panel is legit only if I find many positive reviews, comments and forum posts about it online. Now there are many more legitimate survey panels than before. Most surveys used to have paid registration, now most of them are with free registration. Paid surveys have always been scams. Paid surveys have always been legit. Before there were many more legitimate survey panels than now. Only survey panels that are free to register are legitimate. Only BBB-verified survey panels are legitimate. Which of the Following Would You Define as Scam? Survey panels with paid registration are scam. Sites who sell lists of paid surveys or educational materials about paid surveys are scam. Paid surveys which pay less than they offer are scam. Disqualification from a survey with no points is scam. Disqualification from a survey where you get fewer points is scam. Payment delay of more than a month is scam. Survey panels that require credit card information and SSN are scam. What Would You Do if You Were Scammed by a Paid Survey Panel ? Nothing, but I would stop working with them. Nothing, I would try to work with them again. I would report them to BBB or other complaint sites. I would stop working with all survey panels. I would start posting negative comments about them on forums, blog posts and so on. 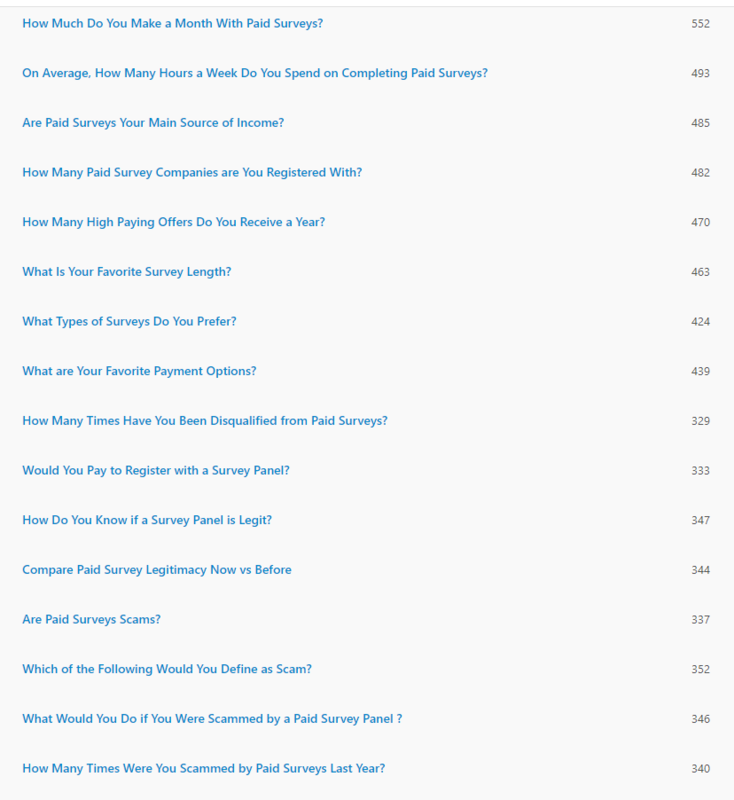 How Many Times Were You Scammed by Paid Surveys Last Year? How Many Times Have You Been Disqualified from Paid Surveys (per 100 Surveys)? Is Your Profile Survey Completed Correctly? I completed my profile survey correctly but I don’t update it. My profile survey is completed correctly and I update it one time a year. My profile survey is completed correctly and I update it few times a year. My profile survey is completed correctly and I update it only when there are changes in my life. My profile survey is not completed or it is completed with wrong details. What is The Most Common Reason for Disqualification? Because of my incorrectly completed/not-updated profile survey. The quota has been reached. The survey panel found that I didn’t answer the questions correctly by inter-connected questions. I completed the whole survey and then I got a message that they couldn’t use my answers. They disqualified me after I completed only a short pre-qualification survey. You Have Been Disqualified. What Would You Say about the Points that You Received? Yes, I understand that my answers can’t be used and I’m ok with the points I received. No, I’m not ok. I feel that they had to pay me more. The survey panel doesn’t offer points for my disqualification. How Did EliteSurveySites Help You? EliteSurveySites helped me understand that people can actually make money with paid surveys. EliteSurveySites helped me understand that paid surveys are not scam. EliteSurveySites helped me start making more money with paid surveys. EliteSurveySites helped me find the best paid survey companies. What Other Survey Blogs Do You Trust When You Pick Survey Panels? Here is the total number of people, who voted!